As we face a gut-wrenching trial with our precious son, we have come to God in prayer, asking He perform His precious promises in our family, for our children. 18 Behold, I and the children whom the Lord has given me are [a]signs and wonders [that are to take place] in Israel from the Lord of hosts, Who dwells on Mount Zion. So I pray for a lifestyle of miracles! That God would do miracles every day in my life, and in the lives of my children! Father, I thank you for Your covenant with me and my family. Thank you for placing Holy Spirit within and your anointing upon us, that we might speak Your words as oracles of heaven, today, and forever. 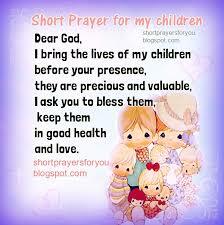 Psalms 102:28 The children of your servants shall dwell secure; their offspring shall be established before you. Thank you Jesus for peace that passes understanding, and protection from heaven. That we are secure in who we are in You, and protected from all evil in the earth. Praise you Father! We love you and thank you for strength and courage to serve you victoriously, that we might be mighty in the land! May we continually seek and walk in purity, walking uprightly as we experience Your blessing. Isaiah 44:3-5 For I will pour water on the thirsty land, and streams on the dry ground; I will pour my Spirit upon your offspring, and my blessing on your descendants. 4 They shall spring up among the grass like willows by flowing streams. 5 This one will say, ‘I am the LORD’s,’ another will call on the name of Jacob, and another will write on his hand, ‘The LORD’s,’ and name himself by the name of Israel. Again, we hunger and thirst for righteousness, for living waters from heaven, the presence of Holy Spirit poured out upon us, Your blessing upon our family, that we might spring up as flowers after a rain. May we boldly declare we belong to Jesus, declaring Your name always, and Your salvation to the ends of the earth. Isaiah 61:8-9 …I will make an everlasting covenant with them. 9 Their offspring shall be known among the nations, and their descendants in the midst of the peoples; all who see them shall acknowledge them, that they are an offspring the LORD has blessed. Isaiah 65:23 They shall not labor in vain or bear children for calamity, for they shall be the offspring of the blessed of the LORD, and their descendants with them. Thank you Father that You bless the works of our hands. It is not in vain, nor will our children experience tragedy or calamity, for You bless, protect and guide us for Your great names sake. Proverbs 20:7 The righteous who walks in his integrity— blessed are his children after him. By Your grace, I will seek You daily Father, and walk in integrity and truth. As I do this, I believe You bless my children after me. Father, You are Holy! May we fear, respect, and obey You only! Deliver us from the fear of man, that we forever find refuge in You, boldness that comes from walking in Your promises. Jeremiah 32:39 I will give them one heart and one way, that they may fear me forever, for their own good and the good of their children after them. Work in our family to walk together in You. One heart, one way, that we might fear and respect you forever, for our own good and the good of children after us. Deuteronomy 4:40 Therefore you shall keep his statutes and his commandments, which I command you today, that it may go well with you and with your children after you, and that you may prolong your days in the land that the LORD your God is giving you for all time. I believe that as we DO your statutes and commandments commanded us, that it goes well with us and our children, that we might experience long, healthy, joyful life in this land you God have given us for all time. Acts 16:31-33 And they said, “Believe in the Lord Jesus, and you will be saved, you and your household.” 32 And they spoke the word of the Lord to him and to all who were in his house. 33 And he took them the same hour of the night and washed their wounds; and he was baptized at once, he and all his family. Father, this promise is forever established before Your throne. I have believed on the Lord Jesus, and all of my family are saved, and will spend eternity with me in heaven. 17 And he shall go before Him in the spirit and power of Elijah, to turn the hearts of the fathers to the children, and the disobedient to the wisdom of the just, to make ready a people prepared for the Lord. Father, I ask that you would turn the heart of my children back to me, and mine to them, from all of our disobedience to what is right in Your sight, that we might be equippers and instructors making people ready for the Lord. As arrows are in the hand of a mighty man; so are children of the youth. Happy is the man that hath his quiver full of them: they shall not be ashamed, but they shall speak with the enemies in the gate. 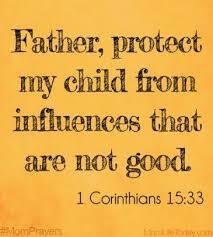 I believe my children are warriors, weapons of righteousness, that stand strong and bold against all evil and enemies of God and His works in the earth. Thus says the Lord, “Restrain your voice from weeping And your eyes from tears, For your work will be rewarded,” says the Lord; “And your children will return from the enemy’s land. Cedar – Sacrifice, Royalty, and WorshipAnd God Said!